You’re in business to grow sales so it’s no surprise more companies are on a full scale manhunt to find the best local SEO expert. Even in local markets across the U.S., more brick and mortars are losing customers and marketshare to poachers. They know you’re hanging on by a thin thread. So stealing your market area is easier than you think. No doubt, it’s probably driving you mad. Why not right? Competition is fierce. So the battle to get your hands on a proven local SEO expert to improve your traffic and conversions is going to be your best defense. Don’t forget, this can be a good thing if you do some market research. Umm, market research? Yes, but not the kind you’re thinking. Chances are you know your own market area. But what you probably lack are bona fide keyword phrases being searched for your products or services. Start by learning the difference between broad keywords and exact searches. The nuances can be staggering. Quality local SEO expert techniques always start with a plethora of keyword research. When you’re hungry, do you chat with your family or friends about food? I’ll bet dollars to donuts it goes more like pizza, Mexican or chicken. Ooh–don’t forget steak and mashed potatoes. My point is you have a specific taste in mind. It’s no different when you working with a local SEO expert. Example time: let’s say you sell fishing tours for trout fishing in Seattle. You want your target keywords to be ones that are specifically being searched together in one word string as they’re typed. Phrase and exact are identical. 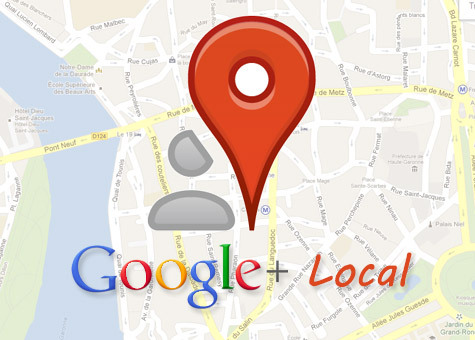 Now you’re on your way to understanding what a local SEO expert should do. But what often happens if you’re a hack of a local SEO expert doesn’t drill down far enough in your research. Simply trying to improve your rankings for ‘trout fishing’ is nuts because you’ll be competing with every other site that has content about trout fishing. Not trout fishing in Seattle. So your local SEO expert then does some more lame research using one of the free tools online and finds out there’s only 20 a month interested in hooking a few. Bummer. Here you thought your nifty, new website was going to lure in new fishing clients. But your current local SEO expert says no, there’s not too many looking for you on Google. Then you scratch your head and wonder why because walk-in business is good. Here’s the juicy part. What you need to do is find related keywords in your area combined with ones in your business. The fun part is once you start doing this type of keyword research you can dig up hundreds of word phrases. You can always measure a local SEO expert by how experienced they are in keyword research. Honestly, it’s the secret sauce that will drive more traffic to your site. 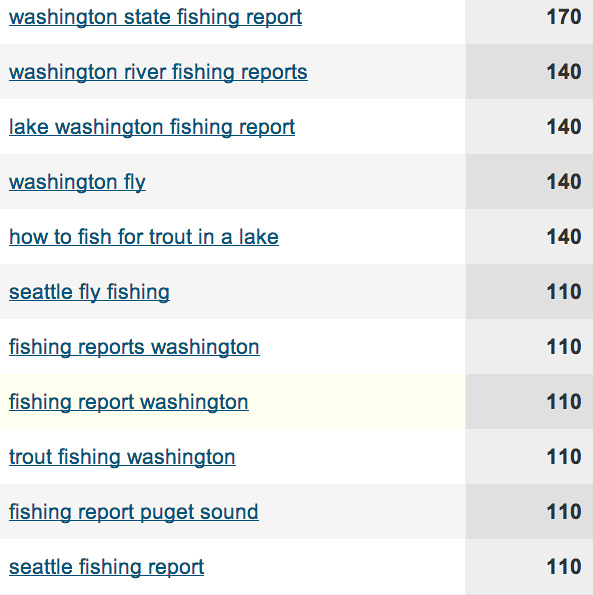 Notice in the graphic to the right there are plenty of related keywords to fishing reports in the Seattle area. That’s gold baby! Think like a six year old. Local SEO expert folks reading this will probably roll their eyes. Start with a broad search for what you sell and then drill down. Keep in mind people searching online just want information. 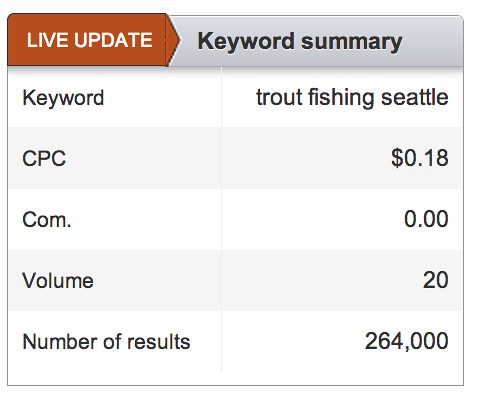 So in this example, you could develop your site content around fishing reports for these keywords. 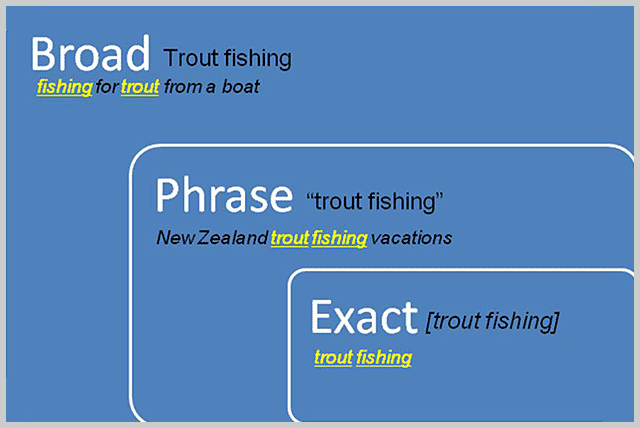 Having done exactly this technique for my Alaska fishing client, I can assure you there’s no competition competing for related longtail keywords. Then there’s the ‘fly fishing’ keywords. Pretty quickly it becomes obvious there’s more than one way to hook a trout. But it can get even better once we develop your local SEO expert plan. Think related keywords. There are truckloads of them waiting for you to target. So the next time any local SEO expert tells you there’s not too many keywords for your business, simply roll your eyes. He (or she) probably isn’t researching ones you need. I’ve found that too many local SEO expert salespeople lack the ability to help you grow your business so beware. Learn more how long it takes for any decent local SEO expert to get you ranked and selling more product and services.